Many fans of modern board games, including myself from time to time, find themselves expressing disappointment that the tabletop gaming hobby is not more widely appreciated in the ‘mainstream’ consciousness. How, we ask, can people not appreciate the fantastic play experiences that we can offer them? Why, we demand, do people still buy dross like Monopoly or Cluedo when far superior games exist? How, we splutter, dare they overlook our finely crafted mechanisms and beautiful production? Of course, the hobby is making steps towards mainstream credibility. More prominent chain stores in the US and UK are starting to stock small numbers of the more approachable titles. It’s nice to walk into Waterstones and see a table with Catan, Pandemic, Ticket to Ride, Forbidden Desert and Sheriff of Nottingham on it. let’s take a look at the potential advantages and disadvantages of a greater mainstream uptake of modern tabletop games. First and foremost, having a wider mainstream player base gives you the feeling of being part of the ‘in’ crowd, more routinely engaging in discussions with others around you about your favourite games. Maybe we could discuss the latest releases from Fantasy Flight instead of the bloody football or whatever crappy group got spat out of X-Factor this week? This also means a bigger player base to draw on, giving you more opponents. This is the biggest advantage for me, and is really part of the dream scenario when we consider our hobby as a mainstream staple. A big part of this would actually be just not having to preface every new game with a long-winded explanation that invariably revolves around explaining how this one is not like Risk or Monopoly and, no, there are neither pie pieces nor wedges of cheese involved. The prospect of knocking crap like Monopoly off the top spot in the public consciousness is also incredibly appealing. The logistics of the industry would also have to change. Mainstream appeal means mainstream demand and production would need to be scaled up. At the moment, board game production is incredibly patchy, with popular and often new games being out of print for long stretches at a time. Mainstream uptake of the hobby would create a greater expectation of availability and, significantly, of lower prices for some games. It probably makes me a snob, but I actually quite like that our hobby is quite niche. I like introducing new people to new games at my discretion and not having to discuss something I really care about with someone I dislike because, hey, it’s small talk. As games become more popular and mainstream, there’s also a real danger of corporate acquisitions where one or two big players come in and buy up all of the little, innovative companies, giving a disproportionate amount of influence to a small handful of companies and stifling creativity. 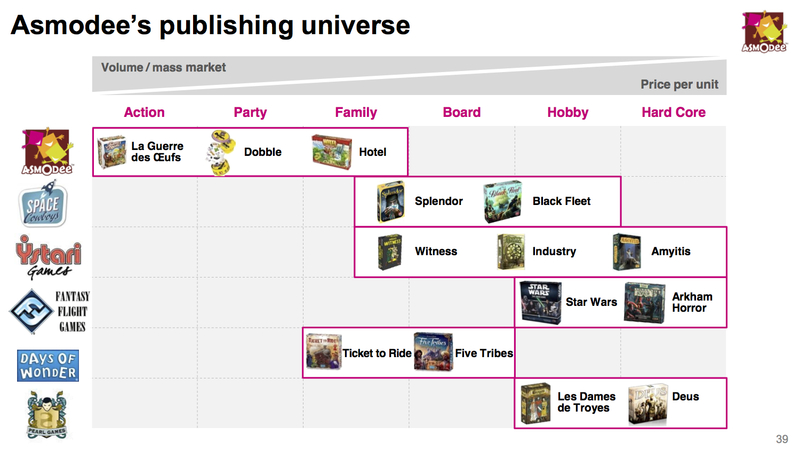 Yes, board gaming is vulnerable to a Monopoly! It’s funny that I speak of all this as a theoretical event when the past few years have seen a this exact scenario play out, with Asmodee buying up company after company and fundamentally altering the eco-system of the industry. I do intend to write about Asmodee in the future, so I will avoid saying too much at the moment, save that they may actually represent an acknowledgement that maybe tabletop gaming is becoming somewhat more mainstream and, as a result, worth investing in. With these acquisitions and mergers comes a problem we have seen before. When Hasbro bought up lots of smaller companies such as Wizards of the Coast and Avalon Hill, they attempted to unleash relatively complex, hobby-style games into the mass market. It did not go well and, arguably, this failure led to Hasbro – who controlled about 80% of the board game market – oversimplifying their output, leading to a dumbing down of board games and leaving us pretty much where we are now in terms of the mass-market. I’d hate to see this happen again, simply because of one company overestimating the appeal of hobby games. I’d hate to see that innovation and complexity lost. Holy crap, going mainstream, or trying to, could destroy the industry I love! Not to sound cynical or selfish but, why should I care? I have my hobby and can usually get a group together once or twice a week for some gaming. It would be nice to have people assume that when I talk about ‘games’ and ‘gaming’ I am talking about board games rather than console-based murder simulators, but I do find that if you take your time and begin with appropriate gateway games, most people can be brought into the fold. It’s a pity that more people are missing out of social plays experiences that they would enjoy, just through lack of awareness, but plenty of great hobbies are niche interests and get along fine. I do think that any change to this would fundamentally change the nature of the industry – particularly around innovation and risk. Some games that get put out cater to relatively small audiences (see GMT Games and their small print runs) or are just odd and can be a hit or miss in terms of gameplay or theme. I like the quirkiness of the hobby and I wouldn’t want that watered down in response to higher investment or larger, costlier print runs.